Grayscale surface relief structures with controlled size, shape, depth, and contour. 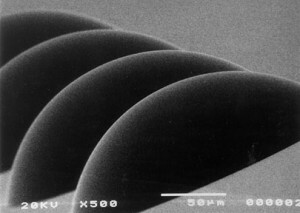 Our main mastering technique at RPC Photonics is based on a laser exposure process that enables the creation of grayscale surface relief structures with controlled size, shape, depth, and contour. Since the early 90’s when we built our first laserwriter, RPC Photonics continues to improve its mastering process which started with thin, a few microns deep, diffractive elements and evolved to the current state-of-the-art where we can produce deep, up to ~80 microns, refractive components. We have designed and built 5 generations of laserwriting systems together with developing all related deep resist processes. 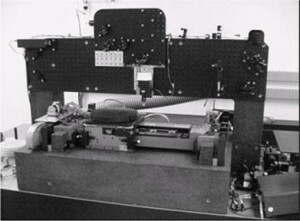 RPC Photonics’ laserwriting process can produce deep analog surface structures. The capability of the laserwriter in producing general surface profiles has also proven useful for customers who have some surface structure that they would like to have fabricated. Depending on size and specifications, RPC Photonics can in some cases produce a laserwritten component in 1-2 weeks for rapid evaluation. 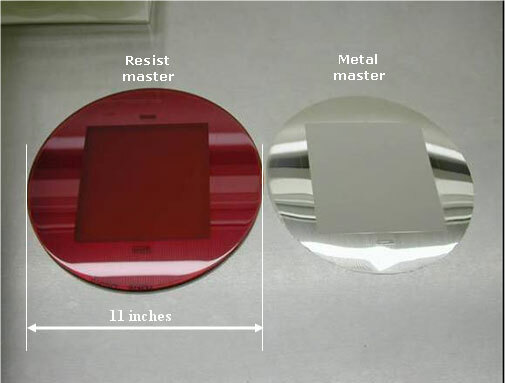 The mastering process starts with a uniform coating of photosensitive material (photoresist) on a substrate, generally fused silica or silicon. The photoresist is then exposed in our laserwriter to a modulated scanning focused beam. After development a continuous surface pattern is left in the resist. Once the laserwritten master is available it can be used to produce sub-masters for replication, electroforming to generate a metal master, or reactive-ion etching to transfer into a hard substrate such as fused silica or silicon.